Redefining, as in “boring”, by chance? Because that’s how I’ve found myself reacting to all the mobile phone announcements recently. 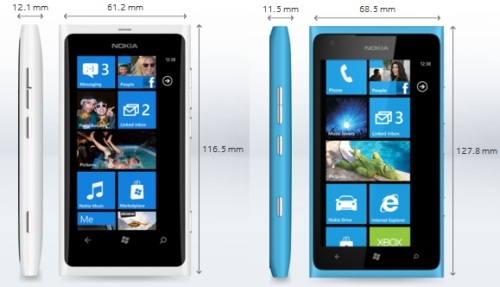 I was doing a comparison between Nokia Lumia 800 and the new Nokia Lumia 900, to figure out if I wanted to ask my employer to get me one or the other. I opened the specs side by side on my monitor in an attempt to analyse the finer engineering details and come up with a winner. I didn’t. It’s the same phone, the same operating system, the same apps. The only clear difference between the two devices is the size of the screen: 3.7″ vs. 4.3″. And even that little detail is kind of a false victory, as the resolution is the same on both of them, because of Windows Phone. The very same OS I already run on my current Samsung Omnia 7, released over a year ago, but of course updated to the latest Mango version. Yes, a significant factor in why the device releases nowadays have become so boring is that hardware makes so little difference anymore. The operating system and the applications continue to marginalize the importance of their host devices. Sure, the build quality of a mobile phone still has to be decent, the screen needs to be good enough and the battery life should be at least one day (well, it is never enough on modern smartphones). Beyond that, I’m having a hard time getting excited about physical attributes in mobile devices anymore. There was a time when each and every round of releases in the world of mobile phones introduced new features that got me thinking “oh yes, that’s something my next phone needs to have”. Now I feel just as much excitement towards the new round of Nokia/Samsung/HTC devices as the sneak preview of the Dell/HP/Lenovo spring line-up of laptops. The manufacturers are now in the role of just a hygiene factor, rather than the driver. The experience on any Windows 7 laptop is going to be fairly identical (for the first few months, until your PC grinds to a halt like they always do). The real differentiator is not a new model from HP with a shinier display – it’s Windows 8. Similarly, in the world of Microsoft-based mobile devices, we’re unlikely to get much surprises or deviation from the release roadmap pointing towards Windows Phone 8. Predictable, reliable, compatible and oh so boring. Yet that doesn’t stop people from buying smartphones. 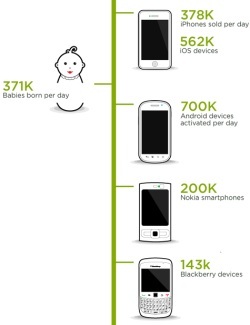 By the looks of these numbers, people hardly make babies anymore, but they sure like to shop around for mobile devices. Everyone and their dog has an iPhone these days. Granted, most of them don’t do much else non-phone use with it but read their Facebook newsfeed, but a global smartphone population in the hundreds of millions will ensure that even niche apps and social networks can carve out a decent market for themselves in the long tail. In MWC 2012 we saw Samsung release a mobile phone with a built-in projector. Nokia, on the other hand, released a phone with a ridiculous 41 megapixel camera, just so they could do away with having a physical zoom. Isn’t that the kind of innovation to really get excited about? Well – not really. If you buy a Samsung Galaxy Beam, you can expect a battery life of 10 minutes for projecting your slides in the meeting, after that you’ve got a brick in your hand where your phone used to be. If you go for a Nokia 808 PureView, you’ll be stuck with a burning platform inside your smartphone, also known as the Symbian OS, which is known for making simple things as sharing photos without cables a nightmare. How many would be comfortable with compromises like these? Neither of these revolutionary devices are able to challenge for the nr. 1 position in your pocket. You wouldn’t replace your iPhone 4S with them, now would you? That’s OK, because they’re not meant to do that anyway. You see, you don’t get to 4.8 billion handsets in the world without selling a few second devices to the 4.0 billion mobile phone owners. Remember when you only had one TV in your house? Or just a single computer for the whole family to use? While there’s a significant population out there who’s already been carrying more than one cell phone in their pockets for years, the main driver behind this has always been telecommunication. Cheap calls to specific networks, optimizing your SMS plans etc. Well, that particular driver is about to go southbound as the whole telco business may have well peaked. As Microsoft continues to bake in services like Skype and GroupMe (both which it owns, btw) into its mobile platform, and as Apple engineers keep dreaming of the SIM-less iPhone, it’s certainly looking like software is about to eat the world of mobile business, like it’s already done elsewhere. What this means is that mobile phones will become capable of everything and everything will be able to perform many of the tasks we use mobile phones for today. Do we really care if it’s a pico projector running on Android OS, or an Android mobile phone carrying a pico projector? If you want your camera to have better connectivity for sharing images onto your other devices and into social networks, why not just start building the solution from a platform that already does the sharing part and just add a killer camera? Why build a universal remote control for home entertainment devices on the old infrared concept, when your smartphone gives you a great touch UI, has WiFi connectivity and so do many of the other gadgets you want to control with it. Perhaps the industry is being “redefined” after all. It simply doesn’t take the same old form of an upgrade cycle for your one and only phone. As Tomi Ahonen puts it, the mantra of the perfect device is over. With tablets, e-readers, ultrabooks and smartphones surrounding our everyday lives, now its time for us to optimize for the perfect device for the particular occasion. 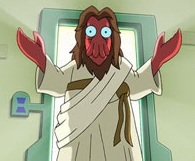 Which means we’ll get to do much more casual gadget shopping and spend less time waiting for the next Jesusphone to be announced. Tagged with Android, gadgets, Microsoft, mobile, Nokia, shopping, Windows 8, Windows Phone.